Sarah Nicolls presents the first performance of her new 'musical activism' project. Here, her own compositions accompany original texts in which fictional characters seek a way forward in the current existential crisis of climate breakdown. Attempting to frame this overwhelming issue within the platform available to her, the sonic canvas of Sarah’s inside-out piano aims to give space to the depth of feeling around this topic. Sarah Nicolls is a UK-based experimental pianist, at the forefront of innovations in piano performance. 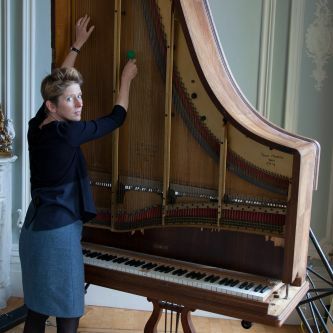 She invented the ‘Inside-out Piano’, a sculptural feast of an instrument played, pushed and swung in her touring show Moments of Weightlessness. Over the past years, Sarah has worked with interactive technologies to augment the acoustic piano with visceral live performances. She has commissioned collaborative new works with composers and has been a frequent soloist, performing at events such as the PRSF New Music Biennial and touring with Matthew Herbert’s 20 Pianos project. Sarah has given many world premieres with the London Sinfonietta including Larry Groves’ Piano Concerto and Richard Barrett’s Mesopotamia. She is regularly broadcast on BBC Radio 3 and features on several CDs. From 2005-2016, Sarah was a Senior Lecturer at Brunel University. She writes about live electronics and compositional collaborations. She was Music Chair for the New Interfaces for Musical Expression Conference, NIME 2014, is the Artistic Director of BEAM Festival and has recently founded a new curating partnership ACCORD with Kit Downes, to create interactive musical experiences for audiences.